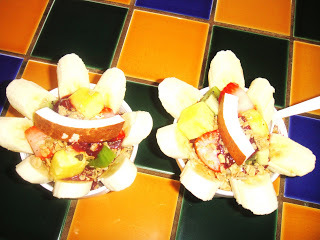 SAN DIEGO BLENDERS- BRAZILIAN ACAI BOWLS! I love Acai Bowls with fresh fruit. Especially when it’s warm out- nothing is more refreshing. In San Diego, there is this place called San Diego Blenders where they are known for their Brazilian Acai, fresh fruit bowls and smoothies, and wheat grass shots and juices. I’ve tried Acai Bowls at other places in LA, and nothing beats the one at San Diego Blenders. Everytime I go to San Diego for the weekend, I always make sure to stop there. When I go to San Diego Blenders, I get the “Brazilian Bowl”- it’s a big bowl with Acai thick smoothie, topped with a lot of fresh fruit and granola. The portion is generous, it’s a meal in itself. Great breakfast or lunch stop when you want something healthy. The fruit is fresh and there is something about the granola they use, I love it. The Brazilian Bowl is the best thing they have in my opinion, but they have so many great options for smoothies and different fruit bowls you can get.